One Happily-Ever-After Rocking Chair and no sign of any forthcoming babies to rock in ol’ Georgebury, Vermont. For Callie Grey, turning thirty means coming to grips with the fact that her boss (and five-week fling) is way overdue in his marriage proposal. And way off track because Mark has suddenly announced his engagement to the company’s new Miss Perfect. If that isn’t bad enough, her mom decides to throw her a three-oh birthday bash in the family funeral home. Bad goes to worse when she stirs up a crazy relationship with the town’s not so warm and fuzzy veterinarian, Ian McFarland, in order to flag Mark’s attention. So Ian is more comfortable with animals. So he’s formal, orderly and just a bit tense. The ever-friendly, fun-loving and spontaneous Callie decides it’s time for Ian to get a personality makeover. But dang, if he doesn’t shock the heck out of her, she might actually fall for Vermont’s unlikeliest eligible bachelor. Kristan Higgins is the RITA award-winning author of CATCH OF THE DAY and three other romantic comedies. Previously a copywriter, Kristan began writing fiction when her children graced her life with simultaneous naps…so much more satisfying than folding laundry. She holds a BA in English from the College of the Holy Cross, which enables her to identify dangling participles and quote many great novels. Kristan lives with her family in Connecticut. This is a beautiful love story. The main character, Callie, is so alive and full of personality. It is hard not to love her; she is sarcastic with a lovely sense of humor and sweet under the tough outer layer. Callie is surrounded by people who care about her and love her (except for about 2 people). Unfortunately the other characters are not brought to life like Callie is in the novel. Most of the characters have unique qualities and personalities but are a little too 2 dimensional. I would have loved to have had Ian brought to life more with knowing what he was thinking some of the times. Most of the time, we just see his flat dialogue and raised eyebrows. The plot itself is award winning. I could not stop reading to find out who Callie ends up with and what all the characters do. There are some twists and turns and heart breaks throughout the novel to make it a novel you can’t put down. I loved Callie’s friends and family; they were all a bit odd but very close and loving. This is a great summer/beach/pool read. 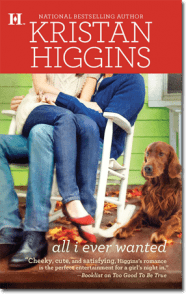 Buy It: You can buy All I Ever Wanted for Kristan Higgins for $7.99 US. This book sounds great! I will have to add it to my To Be Read list!